Matthias Robinson and his family taken outside his home, Landieu, Hartburn circa 1905. Matthias Robinson was the founder of Robinsons Department store which he opened in Stockton on Tees in 1896. My name is Paul Robinson and Matthias is my great grandfather. The Wikipedia entry is slightly incorrect as it was my father, Lionel Robinson, who ran the Stockton store (after Cyril retired) and Cecil ran the Leeds store. Cecil was also Chairman of the business and after he retired Lionel became Chairman. It was Lionel who negotiated the sale of the business to Debenhams in 1962. I have a fairly complete family tree of all of Matthias’s descendants. If you wish to get more information please contact pictures@stockton.gov.uk (Picture Stockton team) and they will pass along my email address. Any old staff of Robinsons remember my mam Imelda Taylor nee Heal she worked in the baby/children’s dept. I started work in 1949 at Mathias Robinson in leeds and left in 1956 I worked in the Gift dept under the buyer Miss Cundalll who was quite a martinet but who ensured we were trained well Miss Thompson Miss Asworth Miss Benstead were colleagues and others whose names I cannot recall. I remember the firm paid for a trip to the Festival of Britain in 1951 ( ? )was a great day out A social club was formed and the first event was a dance at the Scala Ballroom and I met my husband who was the brother of a colleague, we are still together almost 58 yrs later. Ah good memories. I worked at Matthias Robinson’s in the lingerie dept. in Leeds in 1956. I was there for less than a year but my time with Miss Faddy, Miss Black, Miss Appleyard, Miss Ibbotson, Miss Parr, Pat Fairhead and Angela Ingram (we did not use the Christian names of the senior staff) gave me a good grounding in work ethics. Mr. Cecil and Mr. Packman were in charge. Mr. Nigel would arrive in his sports car which he parked in the street; he usually arrived later than everyone else and was quite a hit with the young ladies. I am the great grandson of Arthur in this picture. My father Nigel (son of Cecil) is alive and well, living in the Isle of Man, my brother Charles lives in Cork and my brother Edward Cecil Robinson lives in Vienna. My son George Arthur Robinson lives with us (wife Andrea and daughter Sophie) in Belgium. And Arthur would be my 1st Cousin, 3 times removed. As I am the great-great grandson of William Robinson, who was Matthias’ older brother. Therefore you and I should share the same 3rd great grandfather…Thomas Robinson. Cheers from Canada. Are your children Gavin and Lindsay? Thomas is my great-great-great grandfather also. Matthias is my great-great grandfather. I am the grandson of Rita Robinson and thank you very much for showing this picture. The main road near Stockton Station is Bishopton Lane which leads into Durham Road once you are under the railway bridge. My grandfather, Norman Jacques, worked for Cyril as an assistant manager in stockton up until his death in around 1935. I am doing my family tree and woud love any information you have on him. Stewart Thompson, A very interesting account of an overcoat, how things have changed since those days. See my artical above Stewart, I used to love going through the pattern books when I worked at Robinson”s, the buyer Leslie Armour would give me a magnifying glass to look at the warp and weft of the cloth and compare the thickness”s of the yarn. I can still remember the genuine smell of Harris Tweed “worth a guinea a smell” something else gone forever. They removed the aroma after the second war someone said people did not like the smell! Sumerie clothes were made in Leeds the other firm Robinson”s used was called Heptons, both were excellent tailors. £5.00 bought you a Harris Tweed sports jacket, £15 for a good suit. I had my clothes made by Mr Parker who had his business in a little street leading onto the main road opposite Stockton Station. I think it has all been demolished now, was that main road Durham Road? (I have memory failure). Mr Parker was a Bespoke Tailor, his clothes did not wear out either. Besides being a successful business man, is it possible that Matthias Robinson painted narrative pictures? I am trying to find information about an artist of that name. I worked for Mr Cyril Robinson in the Stockton Mens Wear Department. Cyril engaged me when I left Doggarts shop. My Uncle Fred Kidd was a business friend of Cyril”s and arranged the interview. Mr (Ding Dong) Bell was their London trained manager a fact that Cyril was very proud of. Quite rightly too. Mr Robinson had a great love of farming and loaned me a book which I will never forget “The Endless Furrow” an allegorical story of farming and life itself. I suspect he would have preferred an outside life himself! I learned a lot of very useful things in shop life, how to meet and deal with people,keep stock, and of course sell, with tact,-not high pressure sales!, there were also clothes coupons and sales books. Mr. Leslie Armour was the Mens Wear Buyer and Mr. Micheson was in charge of Soft Furnishing and Materials. Most Departments had their own buyer then came the First Sales person down the hierarchy to we “erks”. Anybody that watched “Are you Being Served” would have a perfect idea of shop life so wonderfully portrayed by all the staff of “Grace Brothers” it was bang on. I was sorry to have to leave, once more because of ill health problems. Matthias Robinsons was a much respected shop – not a store and actually was founded in West Hartlepool. After Cecil Robinson was demobbed, he came with his drawing board from Leeds and designed the Store idea, not quite the same. Leeds was Robinson”s pride and joy and was their latest modern shop. What a shame they have all gone. I would be very pleased to see any relevant photographs. My son Guy found the picture – I am a great grandchild of Matthias and can provide more images of the Stockton store and family history. Andrew Robinson – If you get in touch with Picture Stockton at their e-mail address they will give you my e-mail address and I will contact you direct. Brian, would love to know how you all this about Matthias and his descendants…Arthur and Frederick especially. My name is Andrew Robinson, living in Canada. Matthias would be my great-great-great-grandfather. Any further detail or direction would be greatly appreciated. 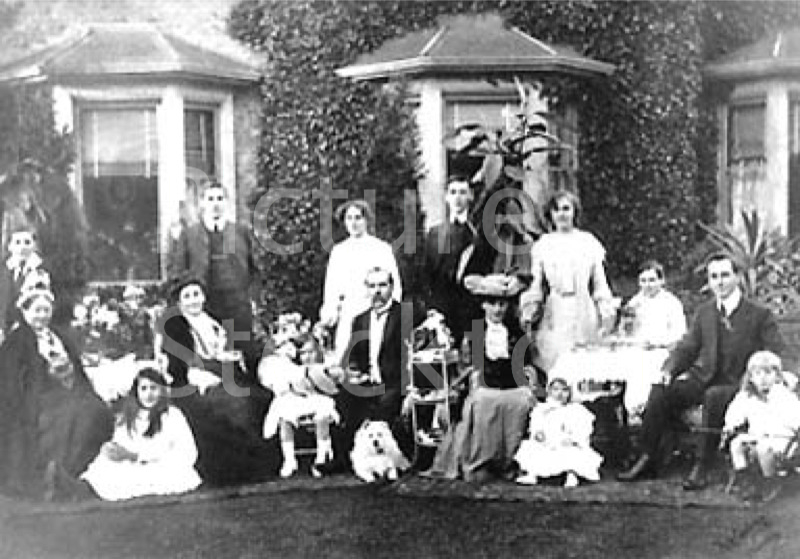 This photograph is of Matthias Robinson and his family taken outside his home, Landieu, Hartburn circa 1905. Matthias Robinson was the founder of Robinson”s Department store which he opened in Stockton on Tees in 1896. The store was bought by Debenhams in 1962. From left to right son Frederick, Granny ?, daughter Kathleen, Mrs Margaret Robinson, son Harold, daughter Elsie, daughter Pera, Matthias Robinson, son Victor, daughter in law & wife of Arthur, daughter Evelyn, grandaughter Rita (seated on floor), son Cyril, son Arthur, grandson Cecil. Arthur joined his father Matthias in the Stockton business which was later run by another son Cyril. Robinson”s department store in Leeds was run by son Cecil. The First World War claimed the lives of two of Matthias Robinson”s sons. Captain Arthur H Robinson in German East Africa and Major Frederick W Robinson DSO, MC in Gallipoli.